UNION, Mo. 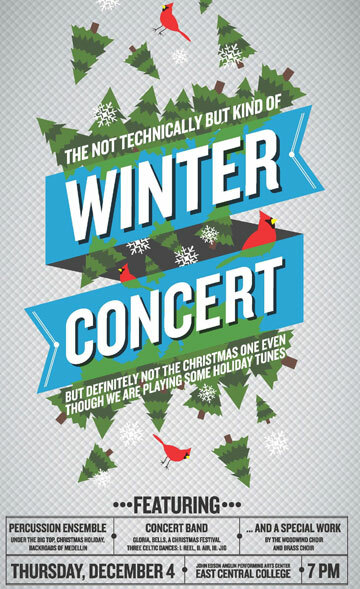 - Two free concerts will kick off the holiday season at East Central College. On Thursday, December 4, the ECC Concert Band and Percussion Ensemble will present a program that will include some holiday selections. The Woodwind and Brass Choirs will also play. The annual Christmas Celebration is set for Friday, December 5. That concert will feature the Jazz Band, Jazz Combo and Voce Blue performing traditional, contemporary and classical Christmas music. Both concerts will begin at 7 p.m. in the John Edson Anglin Performing Arts Center on the ECC campus in Union. There is no admission charge.